Shechen Gyaltsab Gyurme Pema Namgyal was born in 1871 in Dzokyi Tsolung, in the region of Lhatok and Dege. His father, Sherab, belonged to the Adro clan and his mother, Namkha Drolma, was the daughter of a family of Drongpa officials. 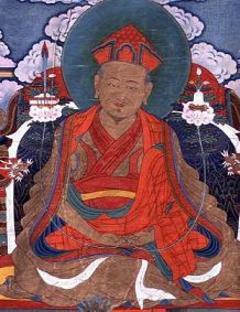 The great Jamyang Khyentse Wangpo recognised him as the reincarnation of the Third Gyaltsab, Orgyen Rangjung Dorje. He was brought to Shechen Tennyi Dargye Ling monastery, where, during his enthronement as the Fourth Gyaltsab, he was given the name Gyurme Pema Tenzin Khedrup Gyamtso De. He began his education under the guidance of his own uncle, Pema Wangchen who taught him how to read. From his uncle he also received teachings on the common sciences, including The Mirror of Poetics, the three systems of Sanskrit grammar (known as Kalapa, Chandrapa and Sarasvati), The Treasure Mine of Composition, and the major texts of the ‘white’ and ‘black’ astrological traditions. He received the novice vows from Dzogchen Khenpo Pema Damchö Öser and was given the name Pema Namgyal. He took full ordination vows under Gemang Khenpo Yönten Gyamtso, and from the time he received these vows until the day he passed away, he applied the strongest discipline in keeping them utterly pure, without transgressing them even in the slightest. He also studied the discipline of the bodhisattva vows under masters such as the great Khenpo Karma Tashi Öser and the Fifth Rabjam Rinpoche. He exerted himself in all points of the inner training of the conduct of the bodhisattva. As a result, bodhicitta completely filled his mind stream and he become solely concerned with benefitting others. From Jamgon Khyentse Wangpo, he received empowerments and instructions on the practices of the Nyingma Kama and Terma traditions, such as Kagyé, Lama Gongdü and Vajrakila. He also studied many Vajrayana practices of the Sarma traditions, including Je Tsongkhapa’s Great Exposition of the Stages of the Path (Lamrim Chenmo) and Karmapa Wangchuk Dorje’s Pointing Out the Dharmakaya. From Jamgon Kongtrul Lodrö Thaye and the Tenth Surmang Trungpa Rinpoche, Karma Chökyi Nyinje he received the empowerments, instructions and transmissions for the Treasury of Precious Termas (Rinchen Terdzö). The unequalled Kongtrul Rinpoche also bestowed on him the reading transmission for all three volumes of his Treasury of Knowledge (Sheja Dzö) and, through placing the texts on his head, formally granted him permission to transmit these teachings in future. The great Khenpo Karma Tashi Öser transmitted to him the empowerments, instructions and reading transmissions for the Treasury of Kagyu Mantras (Kagyu Ngak Dzö), the Collection of Nyingma Tantras (Nyingma Gyübum), the Treasury of Precious Instructions (Damngak Dzö) and the Treasury of Extensive Teachings (Gyachen Kayi Dzö). From Jamgon Mipham Rinpoche, he received the Great Secret Commentary on the practice of Yangdak, the cycle of Jampal Dzogpa Chenpo, An Explanation of the Kagyé, and Mipham’s own Entrance to the Way of Knowledge (Khenjuk). He also clarified the difficult points in the major texts of Sutra and Tantra and in his own practice. He received the reading transmission of the Kangyur twice, once from Barchung Choktrul Thubten Gelek and once from the great Troshul Khenpo Tsultrim Gyamtso. Amongst his many Lamas were the fifth Shechen Rabjam, Khenpo Kunpal, Kathok Situ, Palpung Gyatrul Kunzang Tenpe Nyima, Dzogchen Khenpo Pema Dorje and Patrül Rinpoche. Under their guidance, he studied a great number of commentaries and collected writings of the great masters of the past. In his practice, he focused for more than twenty years on the key points of creation and completion stage practices. Having purified the obscuration to true knowledge, he purified even the most subtle remnants of the klesha obscuration, through taking to heart the essential points of the practice of Dzogchen. Naturally arisen realisation poured forth from his mind stream and the great treasure of his wisdom mind overflowed. In this way, he travelled through the bhumis and the paths and his qualities of experience and realisation reached the very highest level. He excelled in all three activities of the learned: exposition, debate and composition; and through his enlightened activity he nurtured many great masters and holders of the teachings who became his disciples and successors. Amongst them were Dzongsar Khyentse Chökyi Lodrö, the sixth Shechen Rabjam Kunzang Tenpe Nyima, Jamyang Loter Wangpo, Dilgo Khyentse Rinpoche, Palden Chökyi Wangchuk, Pema Drimé Lekpe Lodrö, Dzogchen Lingla Tulku, Khenpo Sochö, Abu Lhagang, Kathok Khenpo Nüden and many others. In this way, the great Shechen Gyaltsab undertook the three practices of listening, reflecting and meditating for his own benefit, and the three activities of teaching, debating and writing for the benefit of others. In 1926, at the age of fifty-five, he merged his wisdom mind into the dharmadhatu.